(Kiel, Germany) The first day of the final series began with more waiting. A cloudy sky and limp flags were dominating the scene at the marina in Schilksee on Thursday morning. 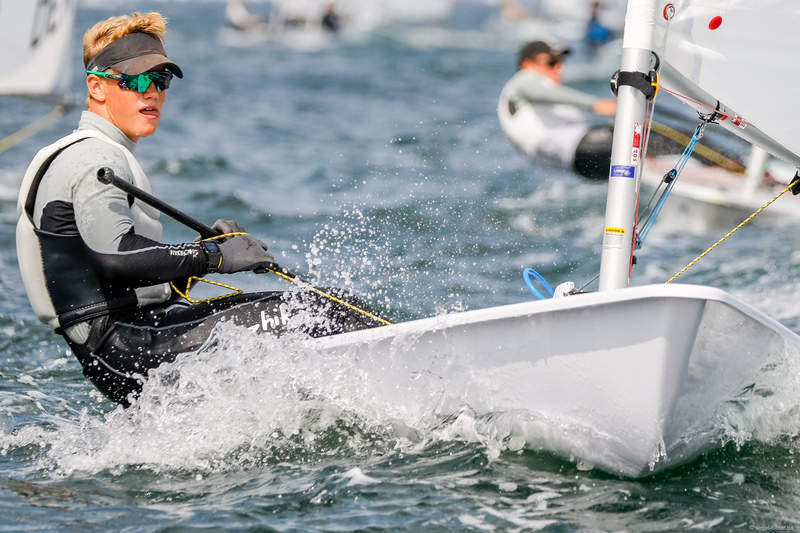 The first start of the Laser Radial Youth World Championships was postponed for two hours. Once the sailors made it onto the water, the stage was set for tight competition. In the boys’ Gold fleet, the leading three sailors began the final series with only one point separating them all. Italian Francesco Viel was only one point ahead of his fellow countryman Guido Gallinaro and Germany’s Julian Hoffmann. Italian Cesare Baranino took the lead in the first race and continued to increase the distance between himself and the fleet, until his victory was sealed. Several times, the Italian sailor had to reach out to remove seaweed from his rudder – but even that could not stop him. American Chase Carraway fought his way up to cross the line in second ahead of the fleet, but it was a close fight for third place. Ireland’s Tom Higgins and Uffe Tomasgaard of Norway battled it out until the Irish sailor was, at last, one step ahead. “With the waves and shifting winds, I just did not make it to get around him. But all in all, it went really well,” said Tomasgaard. “You had to look around the whole time to keep an eye on the gusts. I stood up twice to be able to see where the pressure is.” Tomasgaard obviously read the gusts well. The Norwegian performed most consistently today finishing with a 4th and 5th, which has set him up at the top of the leaderboard. Italian Guido Gallinaro managed to hold his second-place position, while a new name appeared on the leaderboard: another Italian sailor, Cesare Barabino. Viel slid down to 6th overall, while Hoffmann moved to 14th. In the girls’ Gold fleet, German Vanessa Gregor had a dream start for the first race of the day. “I saw the wind shifts and drove to the better side. Since I am coming from a small lake with a dam, I am used to that,” explained the sailor from Remscheid. She was able to extend her lead across the finish line. But the win put pressure on for the second race, and she paired her 1st place with a 44th. “I could not cope with it mentally,” she explained. There were two sailors on the girls’ race course who maintained focus and showed the strongest performance today. Great Britain’s Matilda Nicholls has held top-five finishes over the last two days, and excluding two races, has had consistent top-five finishes at the Championship. The final series is the time to be consistent, and she finished with a 5th and 2nd today, which has boosted her to second place overall. Another consistent performance today came from Spanish Ana Moncada Sánchez. “I was looking for the wind shifts the whole time and went with them,” she said. “It was difficult, but I am very satisfied.” Sánchez is only one point behind Nicholls in third on the leaderboard. 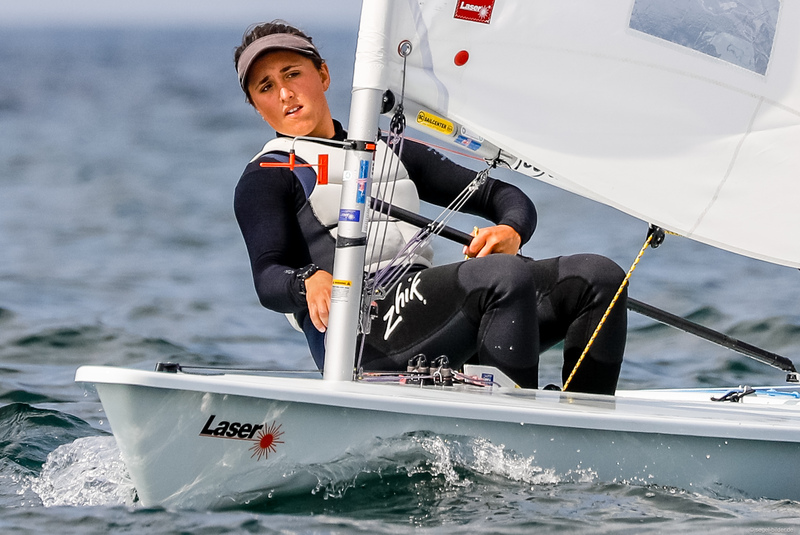 A different Matilda sits atop the leaderboard after Day 4, Matilda Talluri of Italy. She had a difficult first race of the day, finishing 13th, but ended on a high note by winning the second race before heading to shore. Aside from the 13th-place finish, Talluri has maintained top-ten finishes across the entirety of the event. In a regatta where consistency is the key to success, Talluri’s performance has her leading the fleet with two more days ahead. “Until now everything went so well,” summarized Race Organizer Fabian Bach. “We had completely different conditions so far. 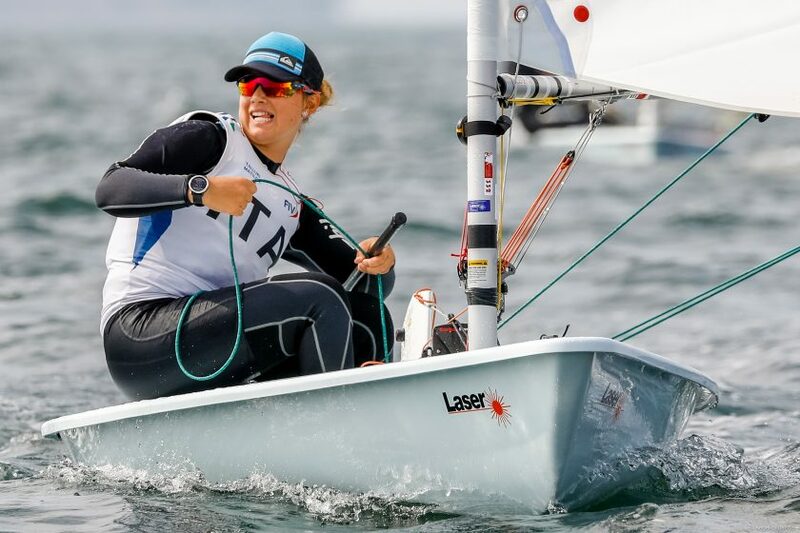 Much wind on Monday, then light winds the last days – something for each sailor.” With 10 – 20-degree shifts, even the experienced teams on the race courses were puzzled, but that is part of the game. “With the stable conditions, we in the race committee are very satisfied.” For the following days, more wind is expected. The racing continues tomorrow, with two races scheduled in each fleet.